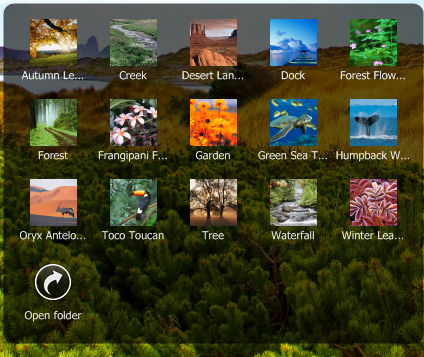 Home >> Freeware >> MAC OSX Like Desktop Icons Stack For Windows OS. In previous posts I shared various icon docks like Rocket Dock , circular dock. But the most eye catchy feature of Mac OSX is the icon dock that shows icons as a stack, you can get the same feature of icon stack in windows using a free tool called Stack Docklet. Stack Docklet lets you arrange icons in the form of a stack or in a grid format.Here’s how you can create a icon stack. Downloaded StandaloneStack, unzip the files into a directory and open the folder. Right-click on this shortcut, choose properties. At the end of “Target” field, enter the name of your stack,For Example : C:\standalonestack\StandaloneStack.exe desktop where desktop is the name of the stack. 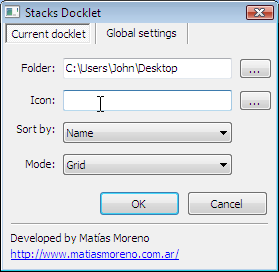 Double-click on the shortcut, the stack docklet properties should appears, and then, choose the folder that you want. Click OK.You can also choose the Mode ie., either Stacked or Grid. Now Double Click on the shortcut to start the stack. Note :If you want to change the properties of the stack, hold SHIFT or CTRL key and double-click on the shortcut. <stack_name> : the name of the stack, and remember that each stack must have a different name. /notaskbar : the stack will not follow the taskbar orientation. /top or /bottom or /left or /right : force the orientation of the stack. Compatible with Windows XP/Vista/NT 2000 SP4. is there a possible way to download this docks to my windows 7 OS? because im not familiar with making this is there any website i can download this kind of docs, i really like the stuff like this..